You Can Grow Healthy Nails! Take a close look at you fingers....do you have healthy nails? If you are looking at your finger nails right now and are thinking, "Gee, my nails are split, dry, cracked and won't grow", then you will want to read this page! 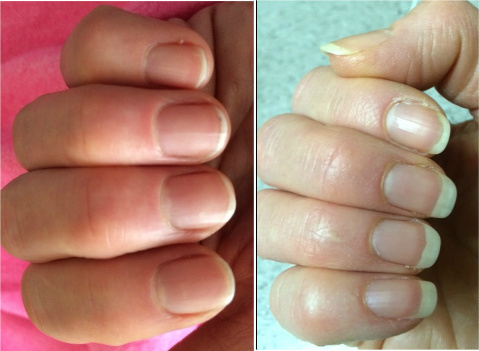 BEFORE and AFTER picture from one of our customers whose nails would crack and split and could not grow healthy nails. Her AFTER picture was taken 4 weeks after using our Healthy Nails special formula. What Are You Doing That Is Hindering Healthy Nails? 1) Nail biting and picking at the cuticles. 2) Cleaning the home with harmful and destructive chemicals without the protection of plastic gloves. 3) Washing hands "way too often" can weaken and soften the nails. 4) Using too much nail polish or glued on nail extensions without giving your nails a "rest". Polish and glue continually block proper moisture levels to the nails. 5) Exposing your hands (and nails of course) to extreme cold weather during winter months and hot water when washing. 5) Poor diet and forgetting to add health building natural supplementation such as found in our Green PowerHouse "Plus". 6) Failing to moisturize your hands AND nails daily followed by a protective coat of natural oils. 7) Failure to stay on top of filing jagged or broken finger nail edges leaving them vulnerable to ripping and tearing. 8) Using your nails as a "tool" to rip open packages. 9) Not taking in enough protein and water in your diet. 10) Neglecting to remove stale and fragmented nail polish and allowing your nails to breath. Nails themselves are made of keratin which is the same substance your body uses to create hair and the top layer of your skin. Keratin is a tough, insoluble protein substance that is the chief structural constituent of not only nails but hair as well. As you just read from the list above, many things can ruin your chance at having great looking, healthy, strong nails. Many of my customers ask me, "What can I do to help my nails grow?" 1) Be mindful and aware of the things that might be hindering your nail growth. Besides the list on this page, I'm sure there are many more things that we are either exposed to or do in a day that can damage our nails. Keeping a journal could help you form your own list. 2) Apply a rich and thick hand cream that draws in moisture and greatly hydrates your hands AND NAILS like our My Daughter's Hand & Body Theracream. Rub this amazing and fast working cream into your nails and watch your nails soak in every drop of cream. 3) Next, apply a coat of our Healthy Nails natural oil blend to each nail and then rub in. Your nails will soak in the oils and will now have a protection that will last all day. This is an important step that is needed to protect your nails from vigorous activity and chemical assault through normal daily activities. Jojoba oil - is extremely hydrating and naturally absorptive and is bacteria-resistant helping to keep nails healthy and fungus free. Below you will find a link to the natural products that, in my professional opinion, work BEST to help you achieve health nails:.